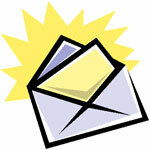 Steele Memorial Library is ready to launch our email notice service. After all, the main library has to keep up with the branch libraries of the Chemung County Library District. Would you like to receive a notice as soon as your reserved item is available? Or, to help you return your library items on time and not have to pay overdue fines, we will be sending out courtesy notices to remind you of upcoming due dates. This service is designed to provide our patrons with current information as well as save the Chemung County Library District on costs for printing notices and postage. Also in the near future all CCLD libraries will be able to send overdue notices by email. This means that you would be receiving your overdue notice 14 days after the item(s) are due and not having to wait for mail delivery. If you would like to sign up for this service, please give your email address to a staff member at the circulation desk or call us at 733-9173. This entry was posted in District News, Steele, Uncategorized and tagged email, fines, notice, notification, overdue, Steele by ccld. Bookmark the permalink. I have been waiting for this service for a long time now!